Parasitic helminths and zoonoses in africa. Coordinators: Craig P., MacPherson C.
Helminths include one of the most diverse and geographically widespread groups of parasites which infect humans and animals. About 100 species have been reported from humans, usually producing asymptomatic infection or mild symptoms. However, about 20 species are of public health importance causing severe or even fatal infections. In many parts of Africa parasitic helminths are responsible for enormous economic losses, hampering rural development programmes and reducing the pace of economic growth. Many parasitic helminths are either zoonoses (diseases naturally transmitted between vertebrate animals and man) or have evolved from animal parasites. The modification of the environment through wars, famine and the ever expanding and increasingly mobile human population brings people into close contact with new environments and wildlife species which makes the study and control of zoonoses of special interest and complexity. In Africa, the transmission of helminth parasites is highly influenced by the ever changing social and cultural differences between diverse groups of peoples and their interaction with wild and domestic animals. It is not surprising, therefore, that approaches to the study and control of parasitic zoonoses require intersectoral cooperation between physicians, veterinarians, parasitologists, zoologists, demographers, anthropologists, engineers and economists to provide the breadth of knowledge and expertise required to develop our understanding of these diseases and to devise methods for their control. 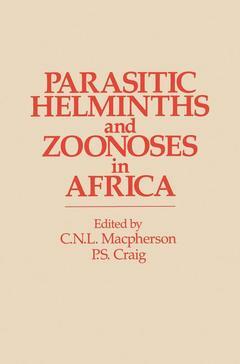 This book provides a selective compilation of parasitic helminths, many of which are zoonoses which create important economic and public health problems in Africa. 1 Helminth zoonoses in African perspective.- Dog and man in Africa.- Cattle and man in Africa.- Future medical-veterinary-zoological cooperation.- Conclusions.- Notes.- References.- 2 Echinococcosis — a plague on pastoralists.- Life cycle.- Current status of human hydatidosis in Africa.- Public health importance of E. granulosus in Africa.- Diagnosis of human hydatidosis.- Serology.- Treatment of human hydatidosis.- Domestic intermediate hosts.- Role of domestic dogs.- Wildlife cycles in Africa.- Species and strain differences of Echinococcus in Africa.- Control.- Conclusions and future prospects.- References.- 3 The zoonotic Taeniae of Africa.- History and biology.- Epidemiology.- Zoonotic importance.- Meat inspection.- Public health measures.- Economic impact.- Diagnosis.- Cysticerosis.- Treatment.- Immunoprophylaxis.- Conclusions.- References.- 4 Trichinella in Africa and the nelsoni affair.- North Africa.- Africa south of the Sahara.- Epidemiology.- The nelsoni affair.- L’envoi.- Afterword.- References.- 5 The African ‘hookworm’ problem: an overview.- Importance and distribution.- Other hookworm-like parasites.- Zoonotic aspects.- Clinical and immunological aspects.- Treatment.- Control.- Future prospects.- References.- 6 Onchocerciasis — river blindness.- Life cycle.- Pathology.- Epidemiology and control within Africa.- Experimental investigations with laboratory models.- Acknowledgements.- References.- 7 Dracunculus in Africa.- Public health importance of dracunculiasis.- Current situation in Africa.- Control measures.- Anthelmintic treatment.- Dracunculiasis as a zoonosis.- References.- 8 Animal reservoirs of schistosomiasis.- Life cycle.- Schistosoma haematobium.- Schistosoma mansoni.- Concluding remarks and recommendation for future studies.- References.- 9 Baboons, bovine and bilharzia vaccines.- Heterologous immunity — the first experimental evidence.- Heterologous and homologous immunity to 5. mansoni compared in baboons.- Heterologous immunity between schistosomes and liver flukes -implications for understanding the immune mechanisms involved.- Pathogenesis of bovine bilharziasis.- Practical evaluation of live vaccines - sheep and cattle.- Practical evaluation of live vaccines in baboons.- References.- 10 Zoonotic helminths of wild and domestic animals in Africa.- Trematode zoonoses.- Cestode zoonoses.- Nematode zoonoses.- Future prospects.- References.